With bitterly cold temperatures and deep snows sweeping across much of the United States, it’s only natural to fantasize about warm weather getaways. Ryder-Walker turns mid-winter fantasies into warm weather realities with the Arches & Canyonlands hiking tour, a nine-day multisport adventure that celebrates the sun in the heart of the American Southwest. Arches & Canyonlands begins in Sedona, Arizona, a town with an established reputation for exquisite dining, inspired art galleries and a plethora of outdoor activities. By day, guests explore an enchanting desert landscape, hiking one of the many backcountry trails that spiderweb throughout the region. By night, sun-tanned explorers relax, with wine in hand, at one of Sedona’s premier luxury resorts. Continuing to the tranquil hamlet of Bluff, Utah, hikers trade their hiking boots for paddles and bounce through one of the most exciting whitewater sections of the San Juan River. Using the riverboat as their base, guests explore ancient rock art and cliff dwellings with some examples dating back 5,000 years. Sun-drenched beaches, lost civilizations and two nights at a historic B&B make Bluff an irresistible desert retreat. No desert tour would be complete without a visit to Moab, Utah, a vibrant oasis that continues to build upon its distinction as an outdoor adventure Mecca. Enthusiastic trekkers leave the well-trodden paths to explore hidden labyrinths, whimsical rock formations and natural sandstone arches. Explorers return from the wild to bed down in one of Moab’s most comfortable retreats, a tranquil hideaway with panoramic views extending in every direction. Indulge in post-hike pampering in the trendy outoor adventure meccas of Sedona, Arizona and Moab, Utah. Blow through memory cards while snapping photos of scenic vistas and vestiges of ancient civilizations. Cost: $3750 per person in double occupancy. Tour includes: Expert guiding, hand picked accommodations at luxury resorts and charming B&B’s, breakfasts and dinners daily, luggage transport, incidental ground transport and more. Contact Ryder-Walker for more details. 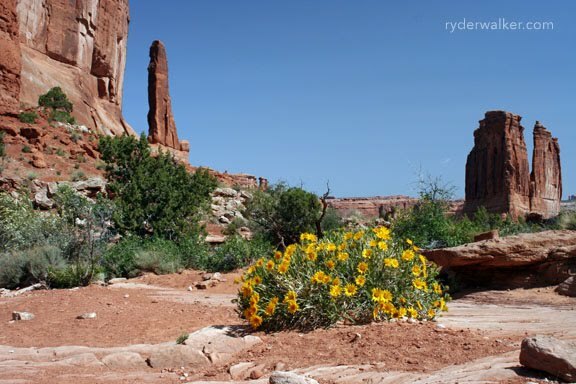 Image: Desert wildflowers flanked by sandstone towers.